but the bad is right there with him. This whole concept is nothing new. But it seems like the latter two have sure had their hayday recently in my life, and I'm constantly needing to look for the good. And with God, I find it. Somedays it's like hacking through jungle vines to get to it, but it's there. 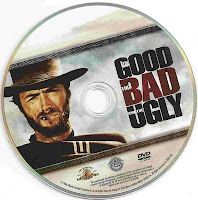 The bad and the ugly want to turn my thoughts away from the good things in my life and from God himself, but if I can hack the clearing big enough - and that takes effort and work - righteousness and hope and healing take center stage and I can smile again. When you're deep into the bad and the ugly, you have to look for the good. I need to remember that God has already won the war, even when I'm fighting the battle. And that's a reason to get up in the morning.